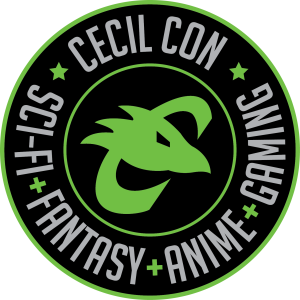 Welcome to the Cecil Con 2019 volunteer info page. PLEASE NOTE: This is an application process and not all who apply will become Cecil Con volunteers. Being a past Cecil Con volunteer does not guarantee that you will be admitted as a volunteer again. – Helping artists, authors, and vendors setup early in the Artist Alley/Vendor’s Hall. – Stuffing swag bags with flyers, postcards, bookmarks, etc. – Organizing Registration booth information and official Cecil Con merchandise. – Hanging Signage throughout the convention to make sure all areas are clearly marked. for attendees. – Helping game designers and developers setup in the Card & Board Game Center and/or the Video Game Center. – Helping other groups setup booths and info areas elsewhere in the convention area. – Setting up the Kid’s Corner with decorations and supplies for activities. – Checking for attendee wristbands at various checkpoints throughout the location. – Answer questions and direct attendees to different areas. – Helping artists, dealers, gaming guests, special guests, panelists, and workshop instructors get to their locations. All volunteers will be given breaks and lunch, depending on the number of shifts. Please ONLY select the shifts you actually want to work. You will be scheduled for the times that you select. Report to the Phys Ed Building, 1st floor, to the Artist Alley/Vendor’s Hall. When your shift starts your mission to stand at either entrance to the Artist Alley/Vendor Hall and check for wristbands on attendees. Please do not leave the door until someone comes in to relieve you. You must check wristbands as attendees enter the hall. Report to the Phys Ed Building, 2nd floor, parking lot area to assist artists and vendors with unloading and finding their table spaces. You will assist Artists, Authors, and Vendors in any way you can to help get them setup. Just be polite and do what you can. Report to the Phys Ed Building, 1st floor, to the Artist Alley/Vendor’s Hall. During your shift your mission is to walk through the Artist Alley and be visible for attendees or vendors who may need to ask you questions or get your help. Also, be on the lookout for wristbands. Report to the pull up area to the back of the Phys Ed Building. You will be helping Artists, Authors, Vendors, and Guests with getting items from their vehicles and bringing them into the Artist Alley/Vendor Hall or Tabletop Game Center. Please guide them to where they need to be and help them carry or wheel items. Report to the location specified. Your mission is simple, photograph/film everything! There is a ton happening at Cecil Con and we want to document as much as possible. Photograph events, setups, attendees, cosplayers, tournaments, game sessions, workshops, panels, anything you can while in that area. These images will be used on our website, social media, or marketing materials for future Cecil Cons. The volunteers placed in this area are to greet attendees and outside guests to the art show and keep an eye on the pieces in the exhibit. It is open during convention hours and so we would like someone to be on hand to answer questions, and direct people to other areas of the convention throughout the day. The Cosplay Contest private judging portion is happening in the Milburn Stone Theatre on campus. During private judging we need volunteers to keep the judging times on schedule by sending in attendees during their judging time and informing judges of when the time is up. We also need volunteers to man the doors of the theatre and check for wristbands as attendees enter to watch the show. The courtyard is the large quad area outside in the center of campus. We have different activities setup for attendees to enjoy and your mission is to be a visible presence to answer questions as needed and help direct attendees. You may be asked to patrol some of our outside entertainment areas to make sure attendees are acting appropriately. Your mission is simple, to patrol around the food trucks we will have line up around campus. You are acting as a visible point of contact for our Food Truck vendors and attendees to ask questions and directions. Report to the Tech Center 2nd floor, to the Kid’s Corner room. Your mission is to be present in the room to help as needed with crafts, activities, movies, and games. You are not to babysit or be left alone with any children. A parent or guardian must be present at all times with their children. This is a relaxing space where families may come to sit, snack, and craft. Just be friendly and give activity suggestions as needed. Report to the Artist Alley/Vendor Hall in the Phys Ed Building 1st floor. Access the door to outside and help direct down vendors and their vehicles as needed. You will be helping Artists, Authors, Vendors, and Guests with directing their vehicles and bringing them into the convention space, and up to the Artist & Author Alley/Vendor’s Hall. Please guide them to Registration and then to that location. Help them carry or wheel items. Use the elevator as needed. Report to lounges in the building we indicate on your schedule. There are times when you will be the only “free floating” volunteer in the area and you are stationed there to be friendly and just keep an eye on things and be there to answer questions and lend assistance as needed. Report to the large theater on the Tech Center 1st floor, to the right as you exit the main stair case. Your mission it to ensure all movies start on time according to the schedule. A staff member will be present to show you what to do, before leaving you to it. But you get to hang out and watch movies! Report to Panel Room A or B, or Workshop Room A or B as indicated on your schedule. Your mission is to check for wristbands as attendees enter the space, check on panelists or workshop instructors at the beginning of their panel/workshop to ensure they are okay and that they don’t need help, also to keep the schedule on time and accurate. You will have a 5 minute flash card to indicate to panelists/instructors when to wrap up. All panels/workshops MUST end with 10 minutes left on the hour to allow the next panelist/instructor to setup. Report to the Phys Ed Building 1st floor to the Tabletop Game Center. Matt Lowder is the Game Master of the Tabletop Game Center, so you should report to him to see where you need to be placed. You may be helping to demo games, checking wristbands at the door, watching over the open game play area, or assisting our special guests. Report to the Tech Center, 2nd floor, in the large conference area. Brandon Boas is the Game Master of the Video Game Center, so you should report to him to see where you need to be placed. You may be checking for attendee wristbands as they enter the area, checking on independent game studios, assisting the Microsoft store, patrolling for attendee appropriate behavior, etc. The volunteers who elect for this option will be placed in an area that requires wristband checks, this may be entrance doors to the convention buildings, or entrance doors to different areas of the convention. Each volunteer MUST apply separately. Please provide the below information only after you've read all of the Volunteer Do's and Don'ts and find no issue with what we need from you. Please provide your most current contact information. We send regular updates as the date of the convention approaches. Thank you! How many 1 hour breaks/lunches do you require? In which areas would you like to be placed? What is your t-shirt size? (required) Please Note: volunteers for Thursday only will not receive a shirt. Do you have previous volunteer experience? If yes, please list and explain. Each volunteer MUST have an emergency contact person for the day of our event. This person will be contacted in the event that something happens to you. Since we may be meeting you for the first time when you come to volunteer for us we want to make sure we know who to contact on your behalf. Thank you!